ATTLEBORO, Mass. – It was like watching a replay, over and over again. Every time the Bombardiers played the ball over the top in the first half, the whistle would blow and the referee’s arm would get raised and the attack would be cut short by an offsides call. 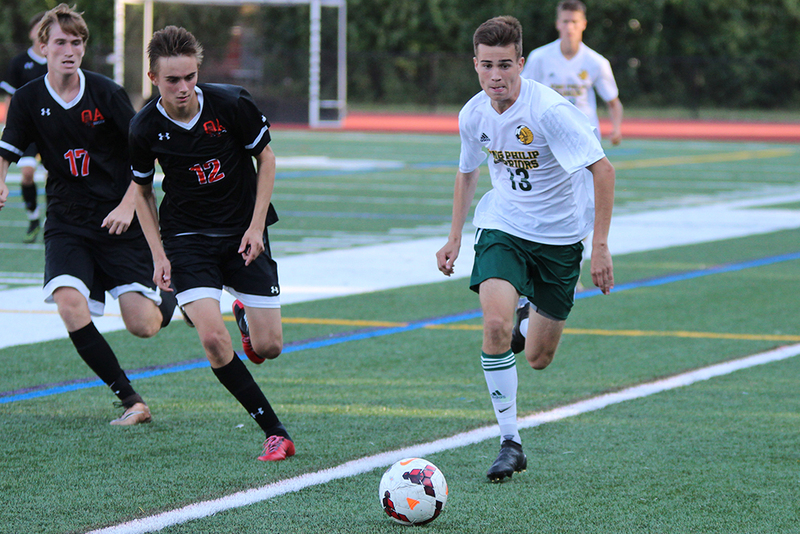 Dartmouth and Attleboro are old rivals from the EAC and the Old Colony League, but the Indians sprung a surprise on the Bombardiers on Saturday morning at Tozier-Cassidy Field by playing a high line that was practically in the opposition half with the keeper out near the 30 yard line. The line worked wonders as Attleboro was called offsides 14 times, according to head coach Peter Pereira, and it felt like much more. Nikolas George scored 14 minutes into the game and it held up to hand Dartmouth the 1-0 non-league win. 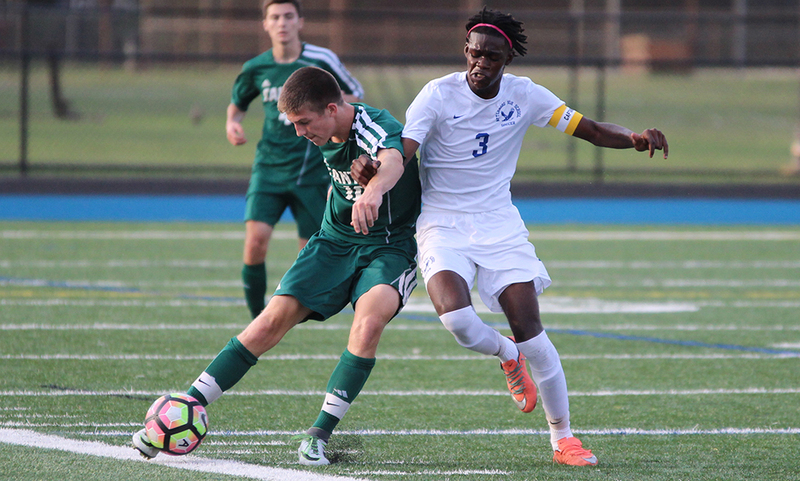 Dartmouth took 13 minutes to create the first chance when Nathaniel Fernandes hit a shot on the half-volley that forced Attleboro keeper Tyler Stowe into a diving save. A minute later, the Indians had the opener. George got behind the Attleboro back four down the left channel and took the ball around the sliding Stowe only to have his shot blocked on the line by Dante Arcese. 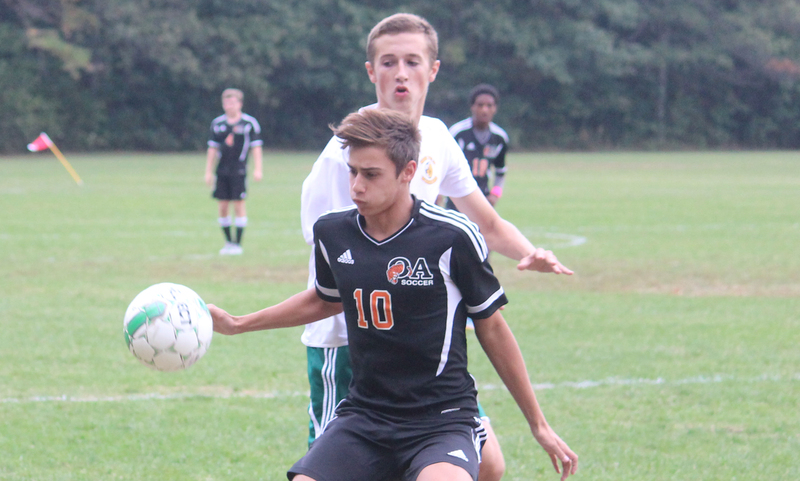 Rather than let the ball go out for a corner, and ignoring the yells of Dartmouth coach Josh Silva, George settled the rebound, dribbled past a scrambling defender, and finished past Stowe at the near post. 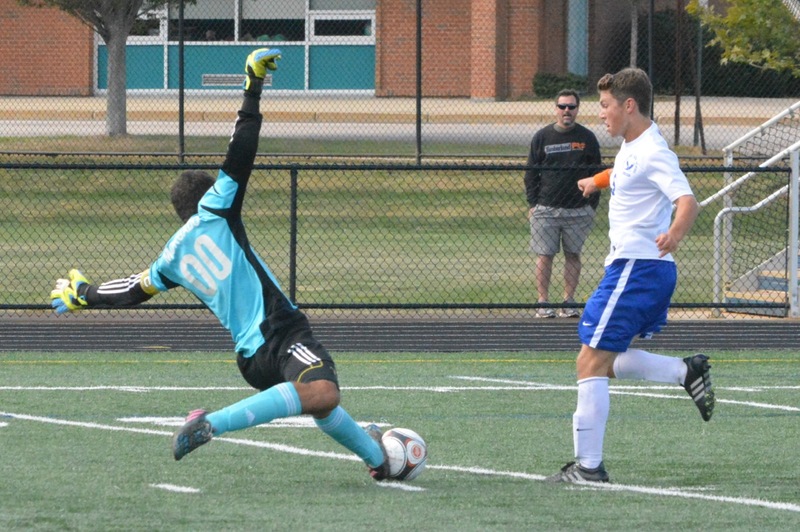 It was a scrappy goal and came out of nothing, but it sparked the Indians into life and they could have put the game away before the break but for Stowe, who made six of his eight saves in the first 40 minutes. He stopped Anthony Neves from close range when the midfielder got to a poor clearance and then again when Neves created space for a left-footed shot that seemed destined for the bottom corner. In the final seconds of the half, he was strong to stop an Isaac Sequeira shot at the near post. Pereira also credited his entire back four (Zach White, Ryan Kearney, Max Bohannon, and Arcese) for its growth since allowing five goals in the season opener against Foxboro. Attleboro struggled to angle or delay its runs in behind the defense, but there were a couple of chances for the Bombardiers. Harry Lancaster, who was moved up front to try and spark the Attleboro attack, slipped through the right channel but could not get his chip high enough to elude keeper Nathan Morgado. Two minutes before the break, Ahijah Joseph had a go from near midfield but Morgado again was able to back pedal and make a comfortable save. “When you’e anxious out there…we had 14 of them and if you cut that in half that’s seven more chances to go to goal,” said Pereira. Pereira let his team know about his frustrations with how the game went in the opening 40 minutes and the halftime team talk seemed to work as Attleboro played much better in the second half, although clear chances were still at a premium. Lancaster had the best chance when he was sprung by a through ball from midfielder Junior Coca but Morgado raced out to make a slide tackle near the 30 yard line and prevent a shot on goal. 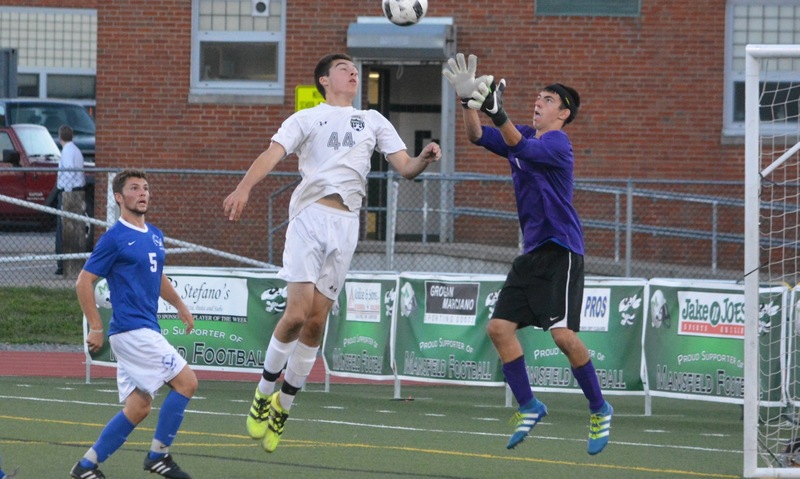 Stowe also had to be sharp to stop shots from Fernandes and Josh Sousa and keep it a one-goal game. Joseph had a shot on target in the 66th minute from the edge of the box, but again Mrogado was in position to make the stop. It would be the last chance Attleboro would create. Zach Rodrigues, Jack Flynn, and Lancaster were also able to spring the offsides trap a few times but either the pass was too heavy or the touches forced the Bombardiers wide. 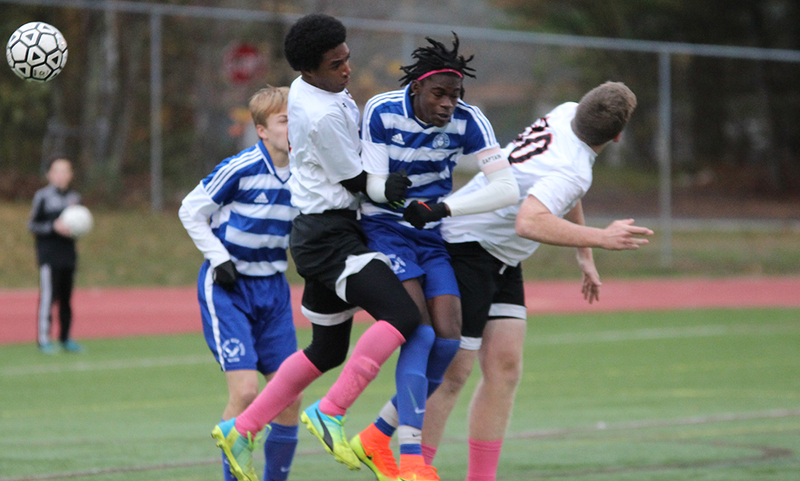 Attleboro (2-4-1) will host league-leading Mansfield on Tuesday night.